High Quality Content by WIKIPEDIA articles! A belt or ammunition belt is a device used to retain and feed cartridges into a firearm. 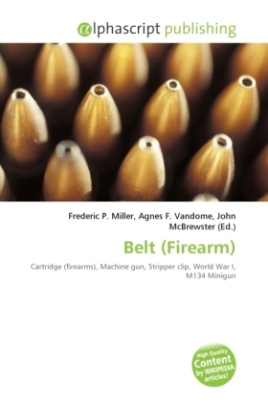 Belts and the associated feed systems are typically employed to feed machine guns or other automatic weapons. Belt-fed systems minimize the proportional weight of the ammunition to the feeding device along with allowing high rates of continuous fire. Belts were originally composed of canvas or cloth with pockets spaced evenly to allow the belt to be mechanically fed into the gun. These designs were prone to malfunctions due to the effects of oil and other contaminants altering the belt. Later belt designs used permanently connected metal links to retain the cartridges during feeding. These belts were more tolerant to exposure to solvents and oil but retained the limitation of being a fixed length or capacity. Many weapons designed to use non-disintegrating or canvas belts are provided with machines to automatically reload these belts with loose rounds or rounds held in stripper clips. In use during World War I, reloaders allowed ammunition belts to be recycled quickly to allow practically continuous fire.